Plant growing at San Diego Zoo, California, USA. 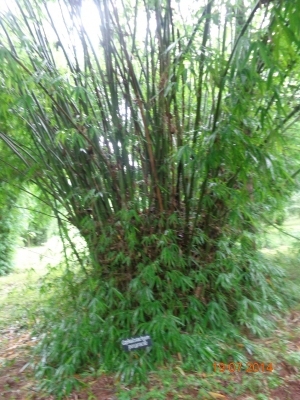 The plant is widely harvested from the wild for its useful canes. It is also sometimes cultivated, both within and outside its native range, both for its canes and as an ornamental. E. Asia - southern China, India, Bangladesh, Myanmar, Thailand, Vietnam. A very comprehensive listing of the bamboos of India, as they were known at the end of the 19th Century. Includes some information on plant uses. It can be downloaded from the Internet. The Commercial Products of India. A classic, with a comprehensive (as then known) listing of useful plants that were traded commercially at that time. It can be downloaded from various sites on the Internet.